Contents gush from a dolls house scale haggis cut with a miniature dirk. Photo copyright 2010 Lesley Shepherd, Licensed to About.com Inc. If your dolls house celebrates Burns Night (25th January), here are the instructions for making a traditional looking miniature haggis from polymer clay. The photo shows a 1:12 scale haggis, which in real life would be roughly 9 inches long and 4 to five inches across. The same instructions can be used to make a wide variety of other traditional sausage cased meats. Haggis is a form of sausage made with spices, oatmeal, onions and sheep's heart, liver and lungs as well as suet. The haggis is normally a rounded or oblong shape, as cooking it by steaming or roasting causes the oatmeal to swell, often bursting the casing. When a haggis is cut open (traditionally with the slice of a knife the length of the haggis) the filling swells up out of the casing as shown above. It is usually served by spooning it out of the casing. Blending and cutting polymer clay to make a dollhouse scale haggis or other sausage. Photo copyright 2010 Lesley Shepherd, Licensed to About.com Inc.
Small Amounts of Polymer Clay in dark brown, beige, white and translucent. Sharp Polymer Clay Blade or a single sided razor blade. Note: As the clay is not clearly visible through the casing, this is a good way to use up bits of waste or slightly discolored clay. Start by rolling thin rolls of mixtures of all of your colors of polymer clay, blended and separate. You will need only tiny amounts of dark brown and white clays. Most of your rolls should be in mid tones, some with a fair amount of translucent clay mixed in. Let the clay rolls cool so that they are firm. Lay the rolls out side by side and use your clay blade to chop or mince the rolls into tiny pieces, allowing the colors to blend as you chop them. Try to keep the clay from blending together as you mince it into tiny pieces. You want the colors to stay in tiny separate bits as shown in the photo above. If your blend appears to dark when it is still in larger pieces (see photo above) remove some of the darker sections and adjust the colors. Keep mincing your clay until you have a convincing blend of sausage style bits. Shaping a basic polymer clay haggis in 1:12 dolls house scale and coating it with a sausage skin. Photo copyright 2010 Lesley Shepherd, Licensed to About.com Inc. Shape Your Haggis - Using your knife blade, gather up your 'minced' polymer clay into a rough American football shape with rounded ends. If your haggis will not be cut open, you can keep it rounder. If it will be cut open, you will need to mound it slightly higher in the center as shown. Keep a small amount of the 'minced' polymer clay separate to use after the casing has been applied. Roll Out Tiny Fat Lines - Most traditional haggis casings have thin lines of fat netted across the inside of the casing. To replicate this in miniature, mix some white and translucent clay and roll out the tiniest lines of clay you can manage. Cut these into small sections and create a net or web of these tiny lines on your work surface. Roll Out a Translucent Sausage Casing - Take translucent clay, or translucent mixed with a tiny bit of white or brown, and roll it as thin as possible, to a size that will easily cover your shaped haggis. You may need to clean your roller in between passes to prevent the thin clay from tearing off on the roller. Use a sharp clay blade to scrape the thin clay off your tile or work surface and lay it down over the fine lines you created at the beginning of this step. Roll the translucent clay into the tiny lines. A semi transparent sausage style skin is fitted over a miniature dolls house haggis made from polymer clay. Photo copyright 2010 Lesley Shepherd, Licensed to About.com Inc.
Encase Your Haggis - Use your clay blade to gently peel the translucent clay with its net of tiny lines from your work surface. Wrap a single layer around your haggis shape and use your clay blade to trim off any excess and trim the ends close to the haggis as shown in the photo above. If your translucent layer breaks, blend tiny bits of the translucent over the breaks. Save a bit of the 'minced' polymer clay to top off your haggis if you want it to be open and gushing. If you want your haggis to be cut open for your display, make a lengthwise cut through the casing at the top of the haggis and gently peel some of the translucent layer away from the cut. Press the translucent layer to the haggis shape without changing the overall shape of your haggis. A fine pin and thin sections of transparent polymer clay are used to make the tied ends of a dolls house scale haggis. Photo copyright 2010 Lesley Shepherd, Licensed to About.com Inc. 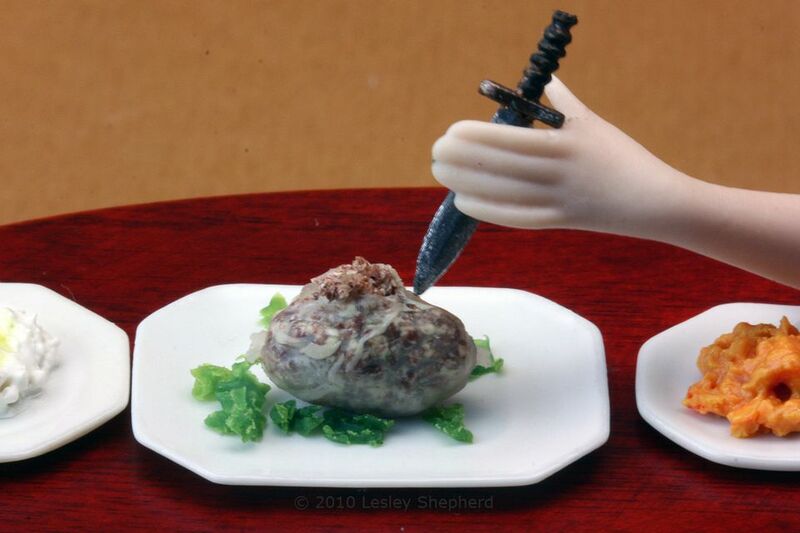 When you have your doll house haggis trimmed, and the translucent 'sausage casing' gently pressed to the surface of your haggis, make tied sausage ends for your haggis. Take a tiny amount of thin translucent clay and make a tiny cone shape over the sharp end of a pin. Use the sharp end of the pin to position the cone on the end of the haggis and slide it off the pin while keeping it shaped like the tied end of a sausage casing. If you want to tie the ends with thread to resemble the string used to tie the haggis, make sure your cone of clay is well attached to the main haggis shape and has enough space between the end of the cone and the body of the haggis to hold a single strand of thread which will look like string. Add tied ends to both sides of your haggis, making sure they are centered on the haggis body and directly opposite each other. Gently peel back some of the transparent sausage casing layer near your cut at the top of the haggis (if you made one) and pile some of your extra chopped polymer clay onto the cut, as if the haggis is swelling out of the cut made in the casing. Use a pin to press the pieces gently in place (or 'glue' them in with a tiny amount of liquid polymer clay). Bake Your Haggis according to the requirements for your particular brand of clay. Dollhouse scale haggis along with the traditional accompaniments of bashed neeps and tatties. Photo copyright 2010 Lesley Shepherd, Licensed to About.com Inc. Depending on the brand of translucent polymer clay you used, you may want to coat your miniature haggis with a wash of semi gloss acrylic finish to make it appear moist from the oven or steamer. If 'roast' haggis is your style, add a bit of roast color to the surface of the haggis with artist's pastels. Side Dishes If you wish you can make dishes of mashed potatoes and bashed neeps to accompany your haggis. These are easiest to make using slightly off white polymer clay for the potatoes, and mixing it to the proper consistency with liquid polymer clay. You can make mashed neeps by mixing a rough blend of yellow/orange clay with some transparent clay and chopping it the same way you made your 'minced' meat for the haggis. Stir in a bit of yellow clay mixed with liquid polymer clay until you have the correct consistency for bashed neeps. If you wish you can cut very thin smeared layers of green polymer clay into strips and 'ruffle' it on one end with a pin, to make greenery to go under your haggis for presentation purposes. Kale or parsley are sometimes found in this role at a traditional Burns Supper.